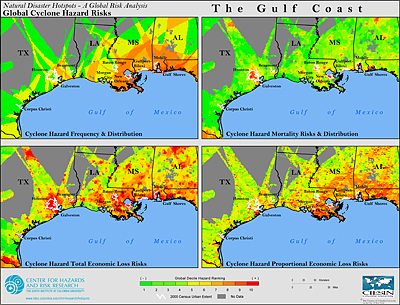 The Natural Disaster Hotspots report released earlier this year showed that the U.S. Gulf Coast is among the world's most at-risk regions in terms of human mortality and economic loss due to storms like Katrina and Rita. The study, which was produced by researchers from the Center for Hazards and Risk Research, The International Research Institute for Climate Prediction (IRI), the Center for International Earth Science Information Network (CIESIN), the Lamont-Doherty Earth Observatory and the World Bank, estimated risk levels by combining hazard exposure with historical vulnerability for two indicators of elements at risk—gridded population and Gross Domestic Product (GDP) per unit area—for six major natural hazards: earthquakes, volcanoes, landslides, floods, drought and cyclones (which are called hurricanes in the North Atlantic and Eastern North Pacific). By calculating relative risks for each grid cell rather than for countries as a whole, the study was able to estimate risk levels at sub-national scales. Such information can help inform a range of disaster prevention and preparedness measures, including prioritization of resources, targeting of more localized and detailed risk assessments, implementation of risk-based disaster management and emergency response strategies, and development of long-term land-use plans and multihazard risk management strategies.